A story from the BBC reports on a shape-shifting mannequin that has been designed to help shoppers to get the right fit/look when buying clothes online. After entering your measurements, the mannequin takes the shape and size of your body. You can let the mannequin try different sized clothing and choose the one that fits you best. You can try out a demonstration on the fits.me website but in this case, the robot is not performing in real-time. 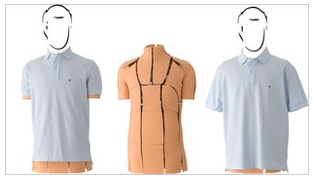 Instead, fits.me puts a small-sized shirt on the robot, and then runs a program where the mannequin shape-shifts into roughly 2,000 different body types, capturing an image for each one. The process is repeated with all the different shirt sizes and the result is a database of images for every shirt, and every size, that can be called up when you input your dimensions online.